Asma'u bint 'Uthman b. Fudi, or Nana Asma’u as she was known, was born in a village called Degel (north-west of Sokoto) in about 1793. 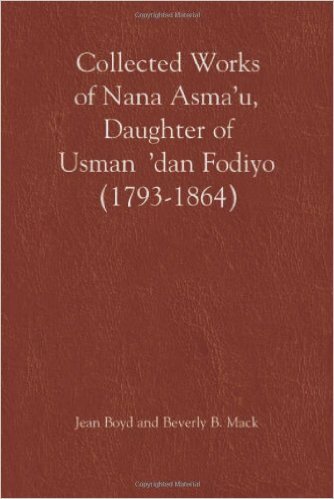 Her father, Shehu Usman dan Fodio, was the leader of the village – he was a religious teacher, he fought a Jihad (he won that). 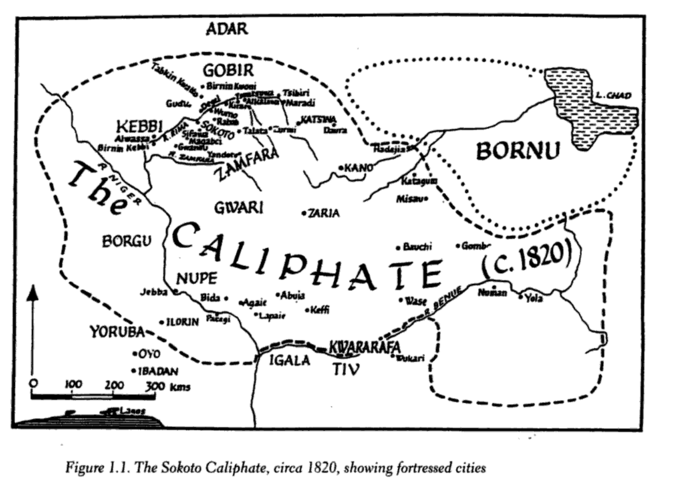 He was also a prolific writer, and (I should mention) he was the founder of the Sokoto Caliphate. 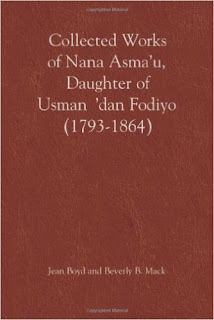 But this isn't about dan Fodio, but scholar, poet, community leader and political commentator Nana Asma'u. 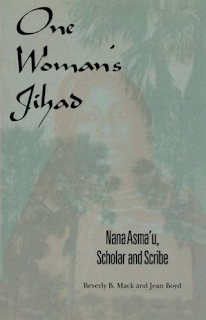 ... was active in politics, education and social reform; she was a prolific author, popular teacher and renowned scholar and intellectual ... During warfare, she was an eyewitness to battles which she reported in her written works ... An accomplished author, Asma'u was well educated, quadrilingual (in Arabic, Fulfulde, Hausa and Tamacheck), and a respected scholar of international repute who was in communication with scholars throughout the sub-Saharan African Muslin world. 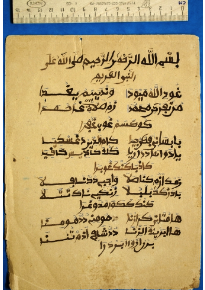 The many books written by leaders of the [Sokoto] Caliphate ... along with Asmau's poetic works were meant as practical guides to individuals at every possible level of social status and degree of academic achievement, from the illiterate to the scholarly. Those who could not read them could hear them; those who could not listen to Arabic or Fulfulde heard Hausa phrases, or particular messages in Hausa. 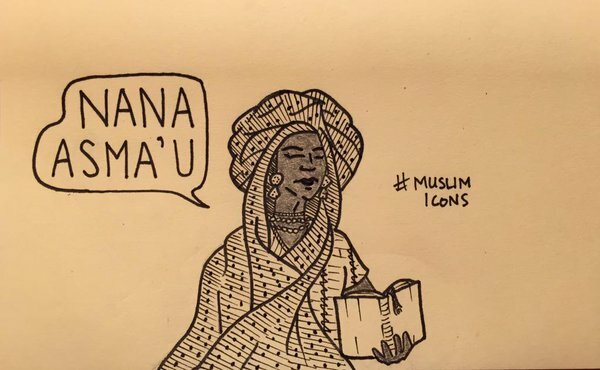 Asma'u, like her colleagues, wrote for the betterment of the community and promotion of the 'Sunna', not for personal fame or gain. A twin, whose brother passed away in 1817, Asmau's spent the first decade of her life focused on scholarly study, at eleven her community migrated to escape persecution, at fourteen she married Gidado dan Laima (who later became the chief adviser [Waziri] of one of Asma'u brother, Caliph Muhammad Bello) and had six sons (one passed away as an infant). 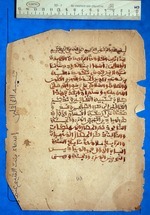 One of Asma'u's first book was The Way of the Pious. It was written in 1820 and was about morality. Asma'u continued to write poems and prose until she passed away in 1864/5. Her works dealt with war, the Sunna and women's roles in the Qadiriyya community. It is said that fifty-two of her works have been discovered, although it could be as high as sixty-one if translations are included - ten of which are 'teaching poems' and seventeen elegies. ... the state of my knowledge, and that of most people, about Asma’u was sketchy. 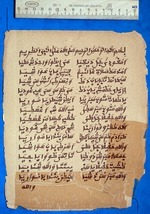 She was certainly famous, but the known facts were few and were limited to the following: she was the Shehu’s daughter and the sister of Bello, whom she had helped, in a miraculous way, when she was making his final attack on Alkalawa; she wrote poetry and her five compositions in Arabic were included in the standard list of Jihad literature. Everyone knew of her but no one I spoke to was able to tell me any details about her life. By April 1978, Boyd was able to put together a three-volume catalogue of Asmau’s works. In 1985, Boyd wrote eight programmes on Asma’u for the BBC World Service which was broadcast in November 1986. 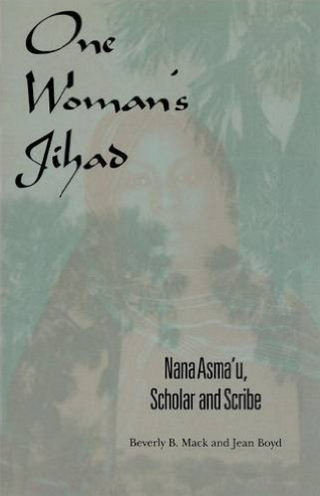 Another brilliant piece on Asma'u is Jean Boyd and Beverly Mack's Collected Works of Nana Asma’u, Daughter of Usman dan Fodio (1793-1864), which compiles her impressive body of poems and treatises in Arabic, the Fula language, and Hausa. Then Bello ordered the standards to be unfurled; he told his men to prepare; he said, 'to-day the unbelievers will be put to shame'. The men got ready and lined up with their weapons; the spearheads looked like fields of ripe millet. With standards flying Bello rode to take up his position at the head (of his men); swords and spears glittered. Round the matchless Caliph the host was as numerous as (flocks of) quela birds or (swarms of) locusts. 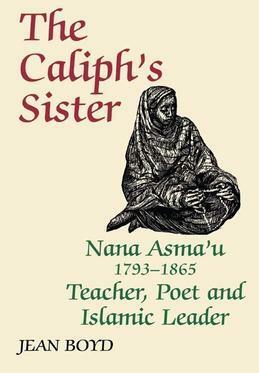 Asma'u also translated her brother, Caliph Muhammad Bello's writings into Fulfulde and Hausa. 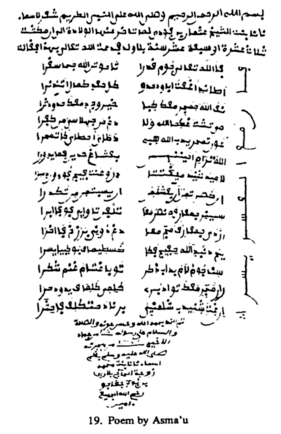 After her brother's death, Asma'u and her husband wrote nine works (five of which were written by Usma'u) on the lives of her father (Shehu) and brother (Bello) - these have been used by historians. The key teaching method employed by the jaji was the repetition and memorisation of poetry composed by Asma’u and other female scholars. 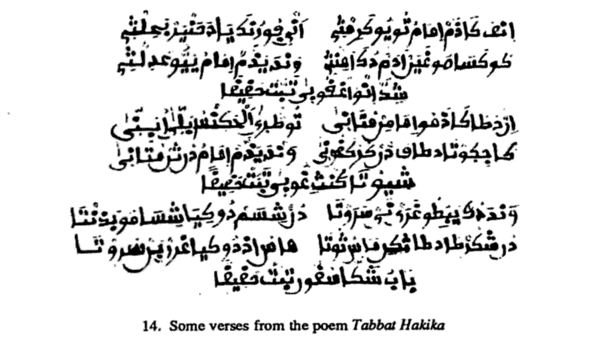 Asma'u made extensive use of mnemonic devices in her poetry, enabling her works to be easily memorised by teachers and students, and explained in further detail during instruction. Through her 'teaching poems' Asma'u taught generations of women and children. Asma'u passed away in 1864/5 - although her classes continued (led by her sister Mariam and her niece Ta Modi), and in the 1870s moved to where her sister lived. A truly phenomenal woman, if you want to learn more about Asma'u, I would recommend the three books cited here: The Caliph's Sister, One Woman's Jihad, and Collected Works. There's also Educating Muslim Women by Mack and Boyd (although I haven't read that one). The SOAS library in London also has archival material of Asma'u's writings.